(Nanowerk News) Despite extensive research efforts, there is still a lack of materials that can render chemical warfare agents harmless quickly and efficiently. 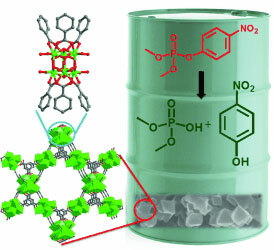 In the journal Angewandte Chemie ("Instantaneous Hydrolysis of Nerve-Agent Simulants with a Six-Connected Zirconium-Based Metal–Organic Framework"), American scientists have now introduced a highly promising material for use in protective equipment and in the disposal of large stockpiles of nerve toxins. The material is based on a zirconium–organic framework structure, and it hydrolyzes a nerve agent simulant within 30 seconds—faster than all other catalysts developed to date. Many chemical warfare agents, such as Sarin, Soman, and Tabun are nerve toxins. They inhibit the enzyme acetylcholinesterase, disrupting the signals between nerves and muscles, which results in respiratory paralysis. The search for new materials to use in reliable protective equipment and for the efficient destruction of large amounts of stored warfare agents has recently focused on metal–organic frameworks (MOFs) as attractive catalyst candidates. MOFs consist of metallic “nodes” bound into three-dimensional frameworks by organic components that act as bridges. Variation of the components allows for the production of highly porous crystalline solids with tailored properties. Last year, a team led by Joseph T. Hupp and Omar K. Farha at Northwestern University (Evanston, USA) and King Abdulaziz University (Jeddah, Saudi Arabia) developed a zirconium-based MOF, UiO-66, that can split nerve toxins. Further development of UiO-66 has been aimed at improving its performance. For example, another research team has recently introduced a new approach for making self-detoxifying filters. These are based on air-permeable textiles impregnated with a lithium-containing version of UiO-66. Hupp, Farha, and their team have now investigated MOF-808, a material similar to UiO-66, though the structure of its framework has been altered. In UiO-66, the zirconium nodes are bridged by 12 small organic connectors. The resulting channels have relatively small openings, which limits catalytic activity to the external surface of the crystals. In MOF-808, however, the zirconium nodes are linked by only six connectors. This results in channels that are wide enough to make the inner surface of the framework accessible, which in turn provides access to a significant number of additional catalytically active centers. MOF-808 is able to degrade a nerve-toxin analogue 350 times faster than UiO-66. Integrated into a filter in a simple plug-flow reactor under continuous flow conditions, it achieved high conversion yields in the detoxification of nerve-gas simulants.